It seems like a long time ago, but for television viewers of a certain age, 1989 was a year of critical importance. Somehow, cynicism and sarcasm had finally made it to the home screen. Brought to life by stand-up comics Larry David and Jerry Seinfeld, NBC’s Seinfeld would go on to create a universe of unapologetically selfish and small-minded individuals that viewers could know and love, changing television forever. Twenty-some years later, entertainment journalist and New York City resident Jennifer Keishin Armstrong looks back at nine seasons of “nothing” in Seinfeldia. Reveling in the fun and nostalgia that continue to this day, Armstrong focuses on some of the secrets to the show’s success; although at the time the show’s creators mostly just seemed crazy. Antagonizing almost everyone, eschewing any genuinely likable characters and avoiding anything resembling a “very special episode”, David and Seinfeld turned everything everybody knew about sitcom writing on its head. Cynicism and greed were presented as sources of endless humor without any sort of humanizing filters in place. Seemingly unconcerned about the longevity of their employment, the duo didn’t hesitate to throw whatever they thought was funny down on paper and make a show out of it. And somehow the NBC executives let them do it. 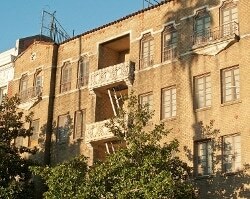 An exterior shot of Jerry’s Manhattan apartment. It’s actually a building in the Koreatown neighborhood of Los Angeles (note the palm tree shadow). Armstrong also includes plenty of details about how the show almost didn’t make it. Despite an initially lukewarm reception and a few years of weak ratings, NBC managed to stick with the show. Even the fourth season – featuring unforgettable episodes like “The Bubble Boy” and “The Contest” – couldn’t beat Dr. Quinn, Medicine Woman in the Nielsen game. It wasn’t until the fifth season that the show ascended to the top tier, going on to become one of the greatest shows of all time. Armstrong does a wonderful job of exploring how the show managed to repeatedly weave reality into the show, basing many of the characters on actual people. These individuals – despite having nothing to do with production of the show – would go on to become minor celebrities themselves. From restaurateur Al Yeganeh (the inspiration for “The Soup Nazi”) to Kenny Kramer (Larry David’s real-life neighbor and the inspiration for Cosmo), the show’s relentless mining of the trivial details of life in New York City were a source of constant amusement. She even introduces the real Joe Davola! The author goes further, making the argument that Seinfeld played a significant role in the rejuvenation of New York City that occurred during the 1990s. She also looks at the subsequent decades, exploring how the show has continued to live on in many bizarre ways. Monk’s Restaurant on the show. 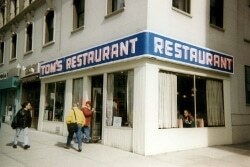 It’s Tom’s Restaurant in Upper West Side Manhattan in real life. Triggering all sorts of nostalgia in this reader, the book is loaded with amusing details about many of the best episodes. “The Junior Mint”. “The Smelly Car”. “The Handicap Spot”. “The Bizzaro Jerry”. Armstrong bases her thoroughly enjoyable narrative on the public record, television archives and dozens of interviews with the actors, writers, directors and other participants in Seinfeld’s production. Deftly assembling it all into a coherent whole, she engagingly chronicles one of the goofiest adventures in entertainment history. It was a show that almost didn’t happen. Somehow the combination of doggedly determined creators, great actors and wisdom in the executive offices at NBC managed to generate a show for the ages. 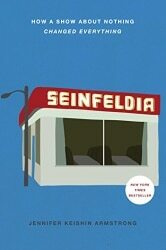 If Seinfeld still runs through your veins after all these years, Seinfeldia is sure to entertain. Highly recommended by this fanatic.